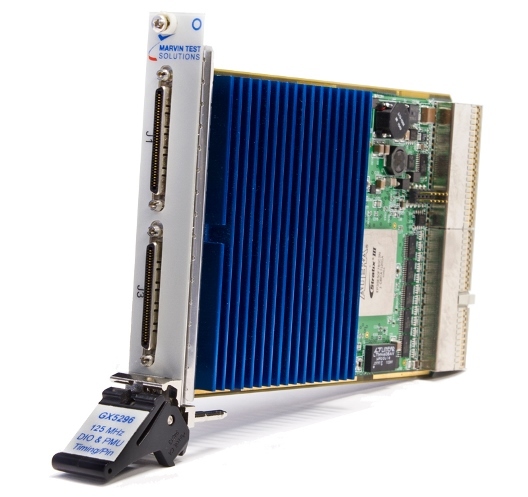 3U PXI Dynamic Digital I/O with Timing per Pin and PMU - GX5296 | Marvin Test Solutions, Inc. The GX5296’s timing generator supports 8 timing phases and 4 windows for drive and sense timing respectively. Each phase and window is comprised of two timing edges - assert / de-assert and an open window / close window respectively. Timing resolution of 250 ps is supported for each of these edges. The 8 phases and 4 windows are available for mapping edge timing to a specific channel. Up to 64 unique time set values can be defined for each phase / window and are selectable on a per sequence step basis. Additionally, six data formats are supported - NR (no return), R0, R1, RHiZ, and RC (Return to Complement), RSC (Return Surround with Complement). Data formatting is assigned on a per channel basis. Pin electronic resources are independent on a per channel basis and include a full-featured PMU for DC characterization of DUTs. The PMU can operate in the force voltage / measure current or force current / measure voltage mode. Additionally, 4 additional pin electronics resources are available for use as timing and/or control resources – providing programmable drive and sense levels from -2 to +7 volts. The GX5296 employs a PLL based, clock system which offers programmable vector clock rates up to 125 MHz. In addition, a clocks per pattern (CPP) divider (1 to 256) is available, providing additional clocking and edge placement flexibility. External input and output synchronization signals are also supported, providing the ability to synchronize the GX5296 to external events or time bases. The GX5296 offers a full-featured sequencer. Capabilities include conditional jump, unconditional jump, subroutine jump, or looping. Additionally, the sequencer has the ability to handshake with external signals in order to synchronize with a UUT. Handshaking settings can be selected on a per step basis and include Handshake Pause and Resume resources. Total sequencer memory size is 4096 steps with each step capable of accessing 1 to 64 M of vector memory. The GX5296 is supplied with graphical vector development / waveform display tools (GtDIO6xEasy) as well as a virtual instrument panel, 32 / 64-bit DLL driver libraries, and documentation. The virtual panel can be used to interactively control and monitor the instrument from a window that displays the instrument’s current settings and status. In addition, ICEAsy Test Suite is available, which provides a comprehensive set of software tools - facilitating the development and debugging of test programs for semiconductor devices. The suite includes I-V curve and Shmoo plot tools for analyzing a device's DC and AC characteristics, a library of device test development tools for creating test programs and characterizing devices, file import tools for importing and converting STIL, WGL, VDC/EVCD, and ATP digital file formats as well as GtDIO6xEasy. The complete suite of tools interfaces seemlessly with Marvin Test Solutions' ATEasy, a test executive and test development evironment. Phase and Window Timing Resolution 1 ns, min.